Medical device manufacturers and importers seeking to break into the New Zealand market must first select an in-country sponsor. New Zealand's Medicines (Database of Medical Devices) Regulations 2003 requires a sponsor to liaise between you and the country's medical regulator, the New Zealand Medicines and Medical Devices Safety Authority (Medsafe). The New Zealand Sponsor manages registration of clients' products with Medsafe, and assumes regulatory representation for those products in New Zealand. Although you can appoint your distributor as your sponsor, choosing an independent third-party entity with no commercial interest in your product allows you to retain more control over your registration process and makes better business sense. You will have to provide your distributor access to your Technical File containing proprietary design information. Medsafe Registration of your devices is completed by your selected sponsor; if you appoint a distributor and then cease doing business with that distributor, you must start the registration process over again with a new sponsor. Appointing a distributor may cause objections with other distributors who may regard your selected sponsor as "first among equals." The distributor is focused on sales. Can you guarantee that your distributor stays up to date on regulatory changes in New Zealand in order to provide you with timely warnings when changes affect your devices? If Medsafe questions an incident or a non-compliance that occurred in the distribution system, will your distributor defend its company or yours? Most distributors are not aware of the role of the sponsor and the mandatory regulatory responsibilities that come with it, including incident reporting and post-market surveillance. 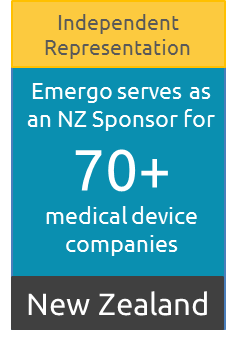 Emergo is a professional, independent sponsor focusing entirely on medical device and IVD regulatory affairs, as well as quality management. Your success in New Zealand is our goal. Register your devices with Medsafe before they are commercialized and notify Medsafe of any changes. Keep your Technical File or Design Dossier ready and available for inspection by Medsafe; we will only release this information to Medsafe with your written approval. Assist in incident reporting to Medsafe, in close liaison with you and your distributors. Notify Medsafe as to which investigations are to be conducted. Act as liaison between you and Medsafe. Act as your primary regulatory contact with Medsafe, including notifications of incidents reported to Medsafe. Please contact us to receive more information on New Zealand Sponsor representation exclusively for medical device and IVD companies.